Over the last few months, several major vulnerabilities in a certain brand of IP cameras have been publicly released. One vulnerability allows remote code execution, while another permits the retrieval of the administrator’s credentials. The situation is made worse by the fact that many of these cameras are reachable on the Internet (around 185,000 according to one of the researcher). It did not take long for miscreants to abuse this discovery, and a novel malicious software 1 was recently propagated through the vulnerable cameras, as described in a 360.cn blog post. This malicious software comes with MIPS and ARM versions, so we decided to quickly analyze it using our brand new MIPS decompiler. This blog post describes our findings. Note: JEB MIPS decompiler being in beta mode, the decompiled output presented in this blog post should be considered with caution; we provide it mainly to allow the reader to get an idea of JEB capabilities. As we are constantly refining the decompiler, the produced code will strongly evolve in the next few months. The main() routine is where the malware logic lies, and will be described below. The interested reader might have noticed the comments in the assembly code. Those comments are the result of what we call the “advanced analysis” step, which can be roughly described as an emulation of the native code (based on JEB custom intermediate representation). This allows to find the actual values manipulated by the code, when those values are the result of previous computations. The advanced analysis will be properly described in a separate blog post. 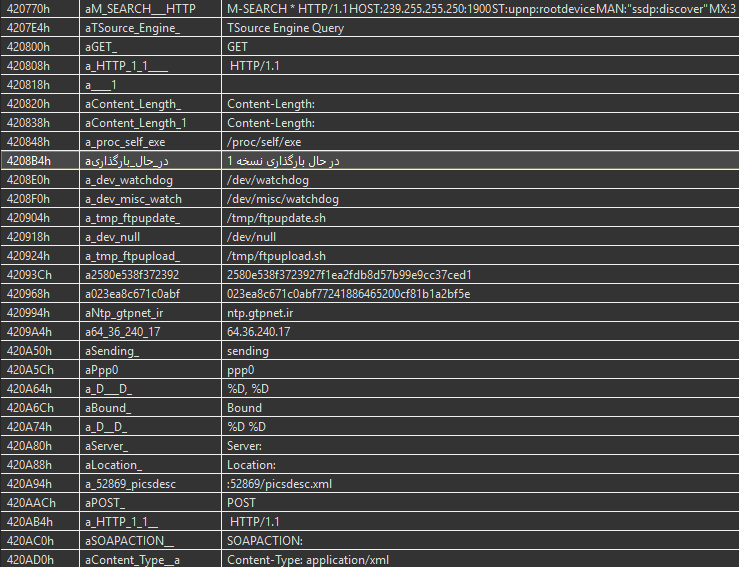 We can observe some likely C&C server information, and various strings related to the malware network abilities. Interestingly, an Arabic string clearly stands out from the others; it can be translated to “Loading Version 1”. 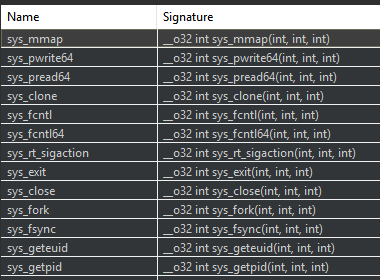 Through this process we renamed around 60 routines that are simply wrappers for syscalls. 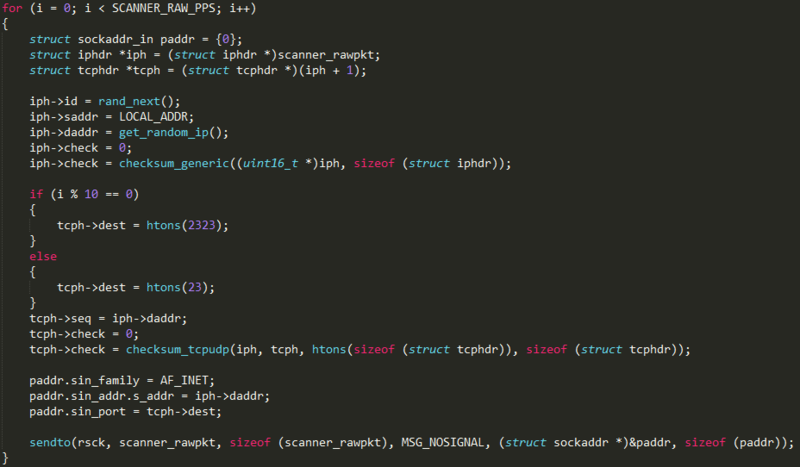 Our reconnaissance step being done, we can now dig into the malware core logic! We start at the main() routine previously mentioned, and describe here the main steps of this malicious software. As we will see, part of this malware code is borrowed from the infamous Mirai malware, whose source code was made public in September 2016. The files /tmp/ftpupdate.sh and /tmp/ftpupload.sh are first removed, then linked to /dev/null. These two files are used by various exploits against these IP cameras, and hence the malware makes sure a newly infected device can not be infected again. 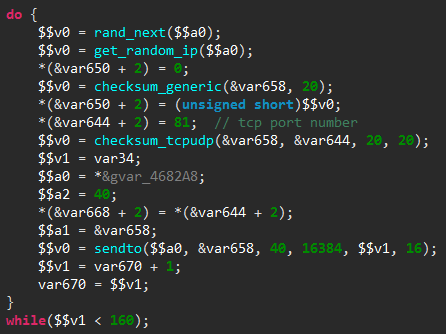 The malware then enters in a loop to fetch 1-byte commands from the C&C server (whose domain name is hardcoded). We counted 8 different commands, some of them having subcommands. We will now describe the most interesting ones. The only major difference is that the TCP destination port is fixed to 81 in our malicious software, rather than alternate between port 23 and 2323 in Mirai. It is worth noting than even the loop counter has the same value (SCANNER_RAW_PPS is set to 160 in Mirai source code). Extract the device administrator’s credentials by sending an HTTP request for the file login.cgi and then parsing the answer for the administrator login and password (documented here). Once the connection has been established with the miscreants’ server thanks to the connect-back payload, the newly infected device is asked to download and run the malicious software, as described in the 360.cn blog post. Another action possibly ordered by the C&C server is to scan for UPnP enabled devices, in order to add a port forwarding entry to them. Such UPnP devices typically include home routers. As mentioned in another 360.cn blog post, this code may be used to exploit the CVE-2014-8361 vulnerability, which allows to execute system commands with root privileges through the <NewInternalClient> SOAP tag. Also, notice the <NewPortMappingDescription> tag set to Skype to attempt hiding the request. As documented in the 360.cn blog, the malicious software can launch a denial of service attack over UDP. The packets are built from the SSDP discovery message, which may also serve as a preparation step for a SSDP reflection attack, though it appears the code for that is not present in the binary. This payload is used in amplification attacks through Valve Source Engine servers. We hope the readers enjoyed this quick analysis; feel free to ask questions in the comments section below. JEB MIPS decompiler is currently in beta mode, and a demo version can be downloaded on our website.